Saver fares are limited in availability and can be removed at any time. No maiden cruise to the great rivers of France would be complete without a trip along one of the most romantic waterways in the world, the Seine, taking you inland to Rouen, the capital of Normandy, for an opportunity to enjoy a day out in romantic Paris, the City of Lights. Stroll through the coastal port of Honfleur and sail the Loire to Nantes, for a scenic ride into the heart of Chateaux Country. Follow the trail of the Gironde to the world capital of wine, Bordeaux, and learn more about the art of winemaking before tasting some of the region’s great vintages. In the Spanish province of Galicia, explore the pilgrimage site of Santiago de Compostela, and in Portuguese Oporto, visit the cathedral or one of the nearby wine estates. 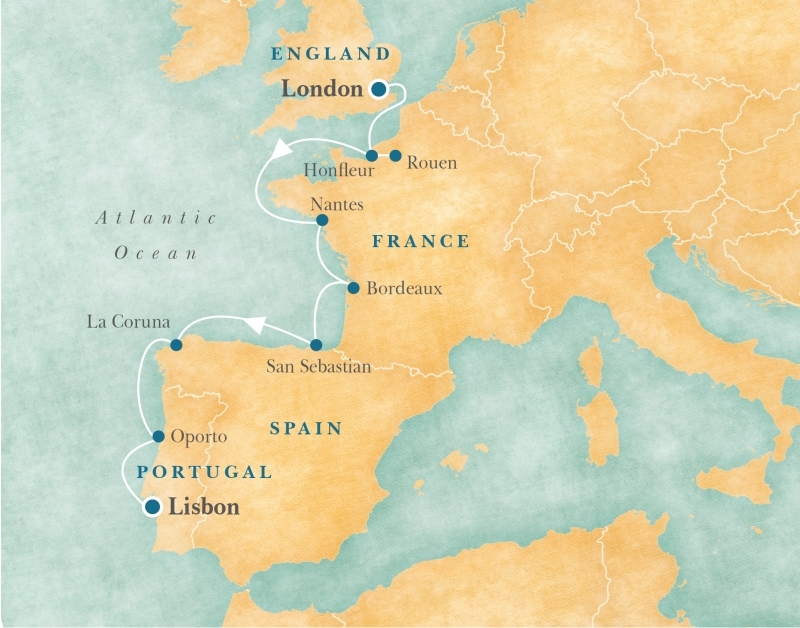 Then spend two nights in the capital of Lisbon, giving you the opportunity to fully experience this captivating city and the idyllic scenery surrounding it. Transfer to Aegean Odyssey at Tilbury, London. River cruising along the Gironde and arrive in Bordeaux. Visit the highlights of the city, including the Palais Rohan. Or venture out of town to one of the prestigious wine estates for tour of the cellars and tasting. Optional afternoon tour available. Fares above are per person in US$. Our website does not display live availability. All prices and availability will be confirmed at time of enquiry. Single supplement offers apply to select categories and departures only. Any special offers are strictly capacity controlled, subject to availability, may be withdrawn at any time and are not always combinable.